If you’re preparing your house for a quick sale in Pueblo, Colorado, there’s some good news and bad news. The good news is that Pueblo has seen a steady market of homes for sale in the last few years, which suggests the community is doing well. The bad news is that this also means there may be some competition if you are trying to sell your home fast. Here are some tips to prepare your house for a sure sell. People really do care about curb appeal. No matter what condition the inside of your house is in, you can give it a quick outdoor makeover to get people’s attention. In fact, if they like the outside of the house, they might even be willing to overlook some less desirable aspects inside. Make sure to clean out your gutters and give the exterior a good power wash. Mow your lawn and make sure your landscaping is neat. This will draw potential buyers right to your door. People want to feel welcomed into a potential home. Your front door is the gateway. Consider applying a fresh coat of paint on the front door and trim. Make sure you have house numbers that are easy to see rom the street. And, get a new welcome mat for an extra special touch. Also make sure that you focus on the landscaping. Remember the curb appeal is the first thing that buyers see when they pull up to the house! It has to be stunning! A rank odor in your house can be the kiss of death for potential home buyers. For example does your bathroom smell like a bathroom?Whether it signals that your house is simply dirty or that there’s a more serious problem like mold or other indications of structural damage, you don’t want people sniffing around. Make sure to give things a really good cleaning. Invest in air neutralizer. You can even add nice smells like fresh flowers or room diffusers. Take some steps to declutter the inside of your house. This is an excellent opportunity to get rid of anything you don’t use anymore and make a trip to the Goodwill. Make sure your closets and drawers are clean and organized. Throw away old food in your pantry. Clear out anything hiding in your kitchen or bathroom cabinets. You don’t want people thinking there’s not enough room for storage. People don’t want to see how you’ve lived in your home. They want to imagine what the house will look like after you’ve moved out. So, make your house as much of a blank slate as possible. Consider putting all your extra personal items into storage (you’ll be moving out anyway soon). If you’ve got some crazy colors on your wall, consider re-painting them a something neutral. You want your house to appeal to a broad sense of taste. These are easy steps you can take to make your home more appealing to potential buyers and help you make that quick sell. 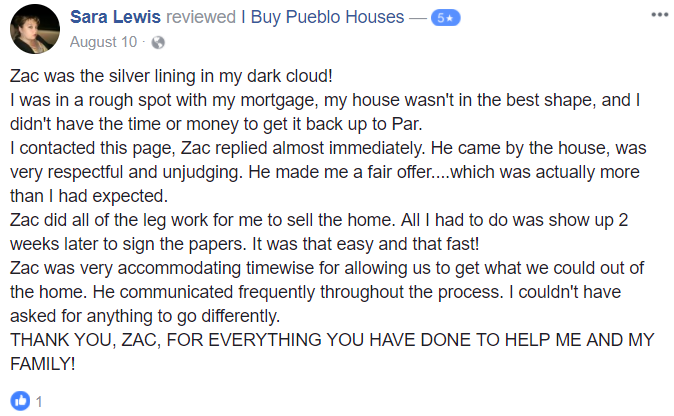 If you need to sell your house fast in pueblo, pueblo west, or canon city feel free to get in contact with me!